I’m not a huge fan. I just don’t feel comfortable when the streets are jam-packed, when I need to constantly dodge other people, when I’m faced with lines and groups and little space to call my own. As travel becomes more and more popular and commonplace though, such tourist crowds seem to be the norm all over the world. Walking down the street in many destinations requires a lot of focus in order to avoid bumping into strollers, lost tourists and group leaders that don’t seem to mind taking over the sidewalks. Of course, I know I’m part of the problem too. I am indeed a tourist visiting these very same destinations. Forget about low seasons and high seasons, forget about visiting cold destinations in the heart of winter or tropical destinations in the middle of monsoon season. It almost doesn’t seem to matter any more. Travelers are everywhere, all the time. We were just in Granada, Spain during what was supposedly the low season. It was 10C / 48F and rainy but the streets were packed and the tapas bars full, every day and every night. Before that we were in Porto, Portugal, walking around in the cold, right alongside thousands of others willing to line up for an hour at the Livraria Lello or ready to walk along the Douro River. In Lisbon earlier this month we were quite thankful to be staying at an Airbnb away from the city center, and away from the crowds that turned the streets of the Chiado and Alfama neighborhoods into one big bus tour. Of course, we still loved these destinations. I’ve always been a strong believer that travel is about the mindset anyway, not the actual places we visit. It really is possible to enjoy any country, city or village if we’re open to getting the most out of our experiences and we focus on the important stuff. For me, that focus has always been local interaction and local activity. At the same time, there are definitely moments when I just want to push through a crowd and keep running until I’m somewhere quiet, somewhere without other tourists around, somewhere without lines, where we can just enjoy our surroundings on our own. The Alhambra is one of the most impressive buildings in Europe. While the Alhambra completely blew me away and quickly became a travel highlight of this year, my mind couldn’t help but drift to Romania at times. The Alhambra. AWESOME. And crowded. 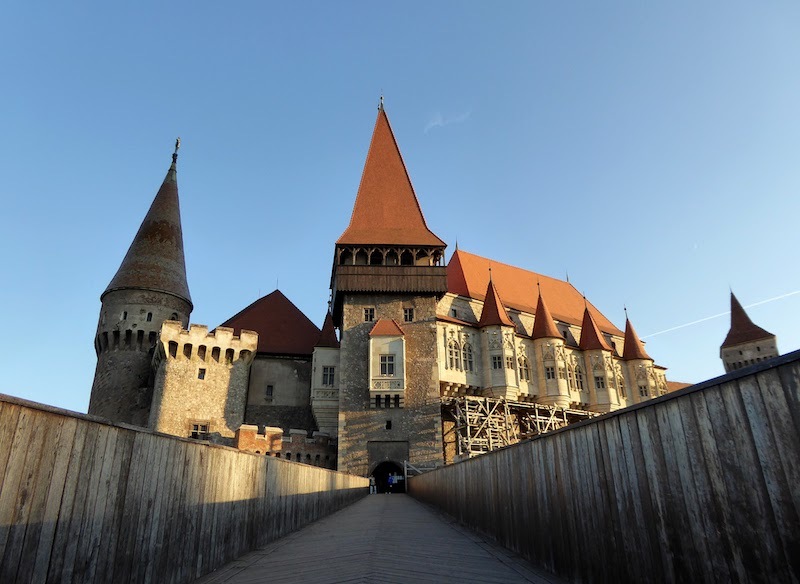 Corvin’s Castle in Hunedoara, Romania. Not as awesome, but definitely remarkable. And no tourist crowds at all. The same goes for Sighisoara, Corund and Sibiu. That short list includes one of the best preserved medieval villages in Europe, a stunning region in the countryside where traditional life is still the norm and a historic and gorgeous city. If all of those places were located in a more popular country, they, too, would be full of crowds. But for now, they offer all the good stuff, without the over-tourism. Naturally, it’s not just Romania. There are many countries where even the greatest of what they offer can be enjoyed without the tourist crowds and lines and buses. Such locations are becoming slightly harder to find these days, but they do still exist. Actually, maybe they aren’t much harder to find. It’s just that everyone wants to visit the same places that they see on social media or that have the marketing budget to promote themselves as the destinations we ‘must see’ now. Or simply a destination where airlines are suddenly offering crazy cheap flights that we simply can’t turn down. Whatever the root, though, it’s worth getting away from the crowds from time to time. There really is something special about having a castle mostly to yourself, even if it’s not rated the most unbelievable castle on the planet. There really is something rewarding about walking into a restaurant and being the only foreigner. Or visiting a small workshop where the family is actually creating something useful for the community, not just to sell to tourists. When you end up in the middle of a local religious ceremony or being invited off the street and into a birthday celebration, chances are high it didn’t happen in the middle of an extremely touristy city. It usually happens in places without crowds, where genuine interaction is still appreciated by all sides. That’s why my mind drifts to Romania every now and then. It’s one of those countries that offers authentic interaction and rewarding travel experiences almost everywhere you go. It’s also why my mind drifts to East Timor, Western Sahara and a local island in the Maldives. It’s why I’m just as happy in the streets of Timisoara or Moshi or on a random dirt road outside of Wanaka, New Zealand talking to a farmer about her horses as I am at the dreamy Gardens By The Bay in Singapore or wandering around Rome. While those popular locations are popular for a reason, sometimes the lack of tourist crowds makes up for the lack of ‘top 10’ sights or ‘must do’ activities. Sometimes all we need is a destination all to ourselves. Of course, ‘all to ourselves’ is impossible…but luckily, there are still destinations out there that offer something pretty darn close. Thoughts? How do you feel about visiting incredible, but crowded, places vs less discovered destinations? I can handle both. I do my best to travel in the less touristy seasons, but am willing to deal with crowds at certain attractions. I do like to have a place to myself sometimes though too, so love to get away from big cities and get out into nature whenever possible. I am not a fan of tourists crowds either, but more often than that I can cope with them if it is to see something I have always wanted to. The masses therefore, are worth it. I must not forget I am a tourist myself and I am one of the masses. Last year I was in Florence, and it was not my first visit there. Whenever I get a chance to go to Florence I love going back and visiting the Duomo. It is always a thrill. Having said that the crowds are constant during the day right up to the late evening and the tour groups with the ubiquitous coloured umbrella holding tour leader are relentless. But because I love seeing the Duomo, I go for it and dodge the crowds, pausing every so often not to walk into a photo. A massive challenge. I made the mistake of visiting Versailles in the summer of 2014 and my god… We waited in line for four hours and were shoulder to shoulder with people throughout the whole walkthrough. It was truly insane. I’m trying to make concerted efforts now to aim my travel ambitions off the beaten path. This is such a hard one. Hopefully the fact that the conversation is even happening is the first step to us all becoming more conscientious travellers? Thanks for sharing. Tourists are now an integral part of many places’ identity now for better or worse. If you’re there and you’re not local, then you are part of that. If you are getting off the beaten path, you are helping to turn it into the beaten path. That’s not necessarily a bad thing. There are huge positives to more and more people getting to experience more of the world. How do we mitigate the downsides so that the big upsides outweigh them? 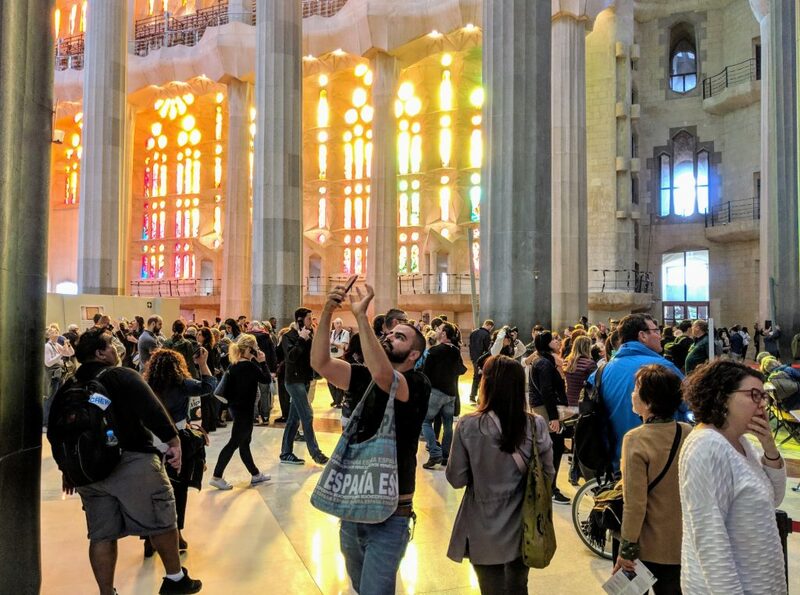 How do we learn to view crowds of tourists like ourselves as an aspect of what a place is and not something separate from it? I think if we ask the questions enough we’ll come up with good answers. I hate crowded place…..I need always some peace……I read this article…..its quite awesome…….thanxxxx buddy…..
Western Europe is especially harder nowadays even if you go off-season. Eastern Europe is still quite alright off-season though but you have to brave the cold and accept that most places wont be open during those times. There are countries that are awesome to visit if you want to avoid the crowds but who knows when that’s gonna change. Nepal and Myanmar used to be that and now it is being run over by mass tourism as well. I guess the lesson here is to travel to these places before mass tourism changes it forever. Canada. Only 35 million of us give or take. Beautiful wild and mostly empty. Stop in and see us! I hear you, I was in Amsterdam (where I used to live, 5 years ago) and was shocked that the tourist population had doubled – and not in a comfortable way. Everyone, that lives there is saying that the city is becoming unbearable and are looking to move out into smaller villages nearby. There needs to be a better balance as no one wants to live in a theme park. And yet as a traveler, I also want to see a new place, cities and get to know other cultures. I’ve been taking the time in my last few trips to spend more time in the smaller countryside towns, away from the crowds. In doing so have discovered some real gems – and enjoying my new take on slow travel. I’d be curious if you now go back to Romania in a year if it has become crowded now that you’ve mentioned it 🙂 I think it’s a tightrope that we walk as travel writers, how to promote travel consciously while being aware of the over-crowding that it might result in. Globally, it has probably to do with our fear of missing out that we desperately try to check all boxes when visiting a place. Will we really have stayed in Chiang Mai for 10 days and not visited the white temple in Chiang Rai nor an elephant sanctuary? 😀 For us personally, I believe we have found a nice balance between visiting a selected few of those “must-sees” and just soaking in the experience of random encounters. Like Michelle said, those experiences are the ones which will be remembered for much longer. If only. In our country, the Philippines, this is why I prefer traveling during the weekdays. Weekends are often too crowded so I just stay at home. For sure, a bit of effort and thinking differently often pays huge dividends in finding unexpected authentic experiences. A tiny example that happened to us recently – just walking back from tourist mania Hermanus center to our AirBnB a few miles out, started talking to a lady who had the lovliest golden retriever I had to say hello to – and she suddenly invites us into her home’s back garden which has a private viewing pool of the whales – awesome & unexpected – which I think is another part of why these kinds of experiences are so great – they aren’t something you can simply buy and so they naturally feel extra special. It’d be interesting to get an out-and-out extrovert take on this topic – whilst I hate generalisations of people, I’d be curious if they typically miss the crowds?? Btw – Granada is absolutely one of our favourite places to visit – your 5-minute walk perhaps needs to be 10 but some wonderful non-tripadvisor tapas bars abound, love it there. The Alhambra is indeed a blow you away place – but to your point – so is the walk out through Sacromento up to the Abbey, since so many people will not walk that far. I am so thankful myself & my partner are both good walkers still, long may it continue! This is an interesting topic Derek because we know; the most popular areas flooded by tourists are usually pretty darn cool…or else they would not be popular 😉 But many less popular spots are even more neat in most regards. Kinda like accepting that Bangkok or Angkor Wat or Times Square will always be packed to some degree, because they are really amazing places, but you’ll find amazing areas in Thailand, Cambodia and NYC that are really chill with much fewer folks around. I also prefer the less crowded places and can’t love Romania more for that. But at the same time I want to see with my own eyes the touristy spots too. I still haven’t been to Rome and am not sure when I visit. I’ve been to Paris a few times but have no reason to go again. I live in Prague and this year especially the crowds are staying even despite the high season being long gone.